Student yearbooks from Gardner-Webb University are now available on DigitalNC.org. Eighty-nine volumes, going back as far as 1907, have been digitized and can be searched and browsed in the North Carolina College and University Yearbooks project. The school was founded in 1905 as Boiling Springs High School, later Boiling Springs Junior College. The name was changed in 1942 in recognition of the support of Governor O. Max Gardner and his wife, Fay Webb Gardner. 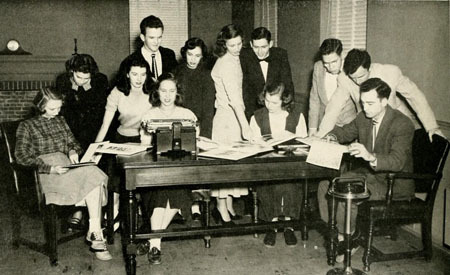 The editorial staff of the 1950 edition of The Anchor.